The Korean grocery store is more than just a place for shopping; it's a site of cultural immersion. 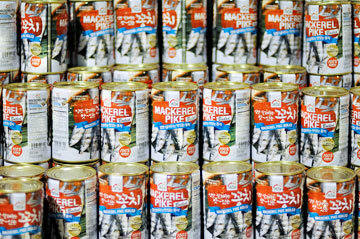 Super H Mart’s appeal is a complex one. It elicits equal parts hunger, nostalgia, and a sense of the surreal. It’s not so much a grocery store as it is an intense cultural immersion program that begins with a techno-blasting karaoke machine and ends with a comprehensive kimchi bar. And it never fails to evoke memories of my sophomore year at Boston College, when my roommate, a very patient Hey-Sung Han, native of Seoul, gently explained to her very Texan roommate, native of Corsicana, that rugs and food could be referred to as Oriental—but not people. Hey-Sung introduced me to all things Korean (happily, bulgogi; unhappily, karaoke). The grocery store is part of a chain that began in 1982 as the Hanahreum Mart in Queens, New York. (Han ah reum means “with armful” in Korean.) There are now 34 H Marts, 11 of them categorized as super, in the United States. The Carrollton outpost opened in 2008 and is tucked away in a former Mervyn’s in an uninspiring shopping center called the Shops at Old Denton Road. It’s easy to miss if you’re on the Trinity Mills frontage road, with the most prominent establishment in that area being an IHOP—quite possibly the perfect yin to the Super H Mart’s yang. This melting pot of Asian food and culture has very American proportions at 78,500 square feet. And, as with most grocery stores, fresh produce, meat, and fish skirt the periphery, while processed and nonperishable foods are placed in center aisles. But that’s really where the similarities end. Aside from the obvious—a food selection that includes entire aisles dedicated to such items as seaweed, soybean paste, or red pepper powder—it throbs with an energy that just doesn’t compare to the foot-shuffling, Rascal-driving vibe typical of any supermarket I’ve ever known. And that energy has me driving two hours round-trip for a Super H Mart fix. It’s a long haul for groceries but a short trek for a traveler’s high. When those glass doors part, I like to fantasize that I’ve stumbled across a large street market somewhere in the heart of Seoul, a city I imagine sounds like a karaoke lounge and smells of sesame oil and sizzling garlic. I wouldn’t know, because I’ve never been to Korea—or anywhere in Asia for that matter. But on a blistering hot Tuesday morning in mid-August at the Carrollton Super H Mart, I feel I must be close. Per usual, the store’s entrance pulsates with a fast-paced ballad sung by a seemingly love-struck Asian man projected onto a large plasma TV. Nearby, a toddler bounces to the beat in her pink dress as her mother inspects a $1,300 kimchi refrigerator. Beyond this opening act lies what many consider the pièce de résistance of the Super H Mart: its vast produce section. On this day, I count seven types of squash (gray, fuzzy, Chinese long, acorn, spaghetti, butternut, and kombucha), six kinds of melons (Korean, gaya, chamelon gaya, hami, honeydew, and watermelon), and who knows how many varieties of bok choy, all neatly bundled according to size. Much of this budget-friendly produce must later be Googled to determine what it is and how it is consumed. Just FYI, Thai okra can be eaten when young and used as a loofah when mature. Also, the lychee-like fruit known as a longan is sometimes referred to as dragon eye because, when peeled, it looks like an eyeball. Getting hungry, I head to the fish market with its row upon row of gleaming, salted mackerel, fresh salmon, dried cod, and large shrink-wrapped packages of minuscule shrimp. But one glimpse of a massive monkfish head sitting in ice can momentarily quell even the heartiest of appetites. Hunger reduced, I move on to the center aisles in an attempt to quantify Super H Mart’s abundance. It’s no easy task. I count 232 varieties of noodles (green tea, organic somen, udon, bean thread, buckwheat, rice stick, and on and on) before I’m distracted by the snack aisle. Stomach growling, I tap into my limited powers of self-control to keep from tearing into tantalizing bags of crisp broad beans, soy sauce melon seeds, and octopus-flavored chips. A sack of fried pig ears makes me quickly recoil, and then take a second look. Aren’t these a Mexican delicacy? Indeed they are. Which brings me to another point: though Super H Mart claims to be an Asian-inspired grocery store, it’s really a supermarket of the world. 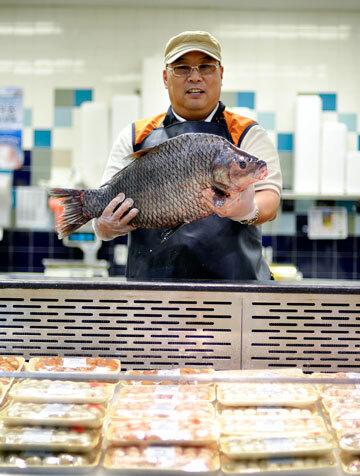 At the Carrollton store, ethnicities from all over the globe rub shoulders on the shelf and in the aisle. Indonesian tempeh lies down with Californian strawberries in the freezer bin while South Asians line up with South Americans at the checkout counters. Yes, I just happen to prefer imagining myself in Seoul, but I could be anywhere, really: Taipei, Singapore, Mumbai. Finally, famished, I skip the home section, which sells everything from $400 pressure cookers to men’s underwear, and make a U-turn for the food court. Super H Mart has eight food stalls said to rival any of those found in Seoul and Singapore, two cities known for their gourmet street food. One sip of Czen’s robustly spicy beef stew (No. 17 on the menu) will make you regret all those greasy slices of Sbarro pizza you’ve mindlessly inhaled. As will Toreoro’s “tasty garlic” Korean fried chicken that, despite its name, has a mild sweetness reminiscent of funnel cake. But on this day, I head to Dami for a big, hot bowl of manduguk and a little walk down memory lane. Manduguk, a beef dumpling soup, is the first Korean dish I ever ate, and it was expertly prepared by my college roommate’s mother, Mrs. Han, on a cold November night in Lexington, Massachusetts. Maybe it was their warm, comfortable home, or the fact that I had to remove my shoes before entering it, or their friendly teasing about the way I accented the word “KOR-ean,” but I distinctly remember this savory soup as being one of the best meals of my life. And now, on this hot Tuesday in August at a grocery store in a Dallas suburb (which also happens to be home to Sandy Lake Amusement Park and the birthplace of rapper Vanilla Ice), I was enjoying that very same soup. Weird. 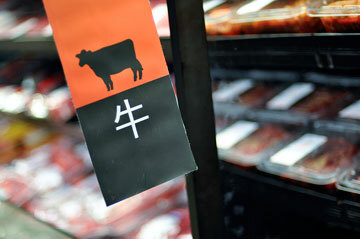 My advice to the Super H Mart neophyte? Approach the store the way you would a large museum. Pace yourself. Go for moderate amounts of time (no more than three hours), and go often. If you’re looking to shop, eat at the food court beforehand. You’ll end up there anyway, most likely after you’ve filled your cart with fresh fish and frozen dumplings. If you’re looking to eat, work up an appetite by perusing the mall shops first, which are separate entities from the H Mart. They sell clothing, jewelry, flowers, and shoes, but there is also a beauty salon, a law office specializing in immigration, an accountant, and an appliance store that curiously carries only tricked-out toilets, vacuums, and water filtration systems. Finally, if you’re pressed for time, skip aisles 10 and 11, unless you just want to see familiar faces, namely Uncle Ben and Aunt Jemima. Full on manduguk and memories, I prepare for re-entry into a surreal suburban parking lot by grabbing a sack of mini-cream puffs (or choux) from the French Asian bakery Tous Les Jours. The glass doors part, and, rather abruptly, I leave Seoul, my past, and the wonderful world known as the Super H Mart far behind.